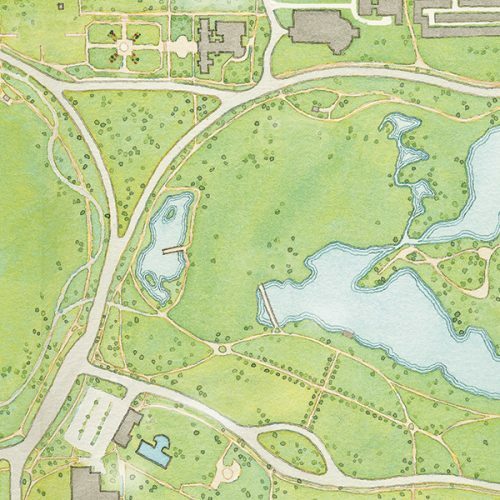 Pen, ink, and watercolor map of Washington Park for the Chicago Park District. This map and two others were used on outdoor signage highlighting improvements to the parks’ natural areas. Frederick Law Olmsted designed this beautiful park, which is on the�National Register of Historic Places, in the�early 1870s. By the�way, if you’re ever in the�Chicago Park District offices, ask to be pointed to�the walls where�hang handsome original drawings for city parks. Hand-rendered, computer compiled map of Chicago's Washington Park.